Saint John XXIII Catholic Community, Inc. 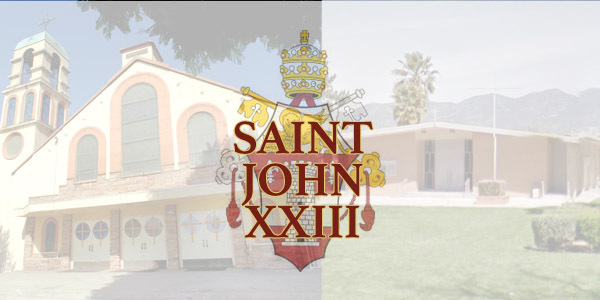 Founded in 2006 with the combination of St. Thomas More in Rialto and Resurrection in Fontana, St. John XIII seeks to nourish the Gospel of Jesus Christ in all families and people. Parochial Vicar: Rev. Jacob Thomas Vettathu, M.S. Sunday: 6:15 a.m. (Spanish) 8:00 a.m. 9:30 a.m. 11:00 a.m.
Holy Days: Vigil 7:00 p.m. 7:30 a.m. 10:30 a.m.
Devotions: Monday 10:00 a.m. - 12:00 p.m.
Tuesday 8:00 a.m. Thursday 10:00 a.m. - 11:00 a.m.
Friday 7:00 p.m. - 9:00 p.m.
Saturdays 4:00 p.m. - 5:00 p.m.
Saturdays 3:00 p.m. - 4:00 p.m. or by appt.